We always closely watch the hurricanes over the summer and fall seasons, since our island in Belize is particularly exposed (35 miles offshore with only an 26′ maximum elevation, although much lower on the shore where all of our buildings are located). The 2014 hurricane season has almost come to a close. It officially ends on November 30, but only 1-2% of hurricanes ever form after November 1, so we are feeling pretty good right now. The hurricane season of 2014 was remarkably quiet in the Atlantic basin where our island is located, and ranks approximately in the lowest 5% of total hurricanes and tropical storms ever recorded. Conversely, the storm belt known as the eastern Pacific (the west coast of Mexico) saw the most ever recorded number of storms. The most recent storm, Hurricane Vance, just dissipated less than a week ago. Tropical storms are named in alphabetical order, so to get to a ‘V’ named storm gives you an indication of how many there were this season on the west coast! So when we see such a benign storm season we are always relieved. But one never knows what next season will bring, the storm patterns are very fickle and we never can relax once September rolls around! Here is a map of this season’s storm tracks. 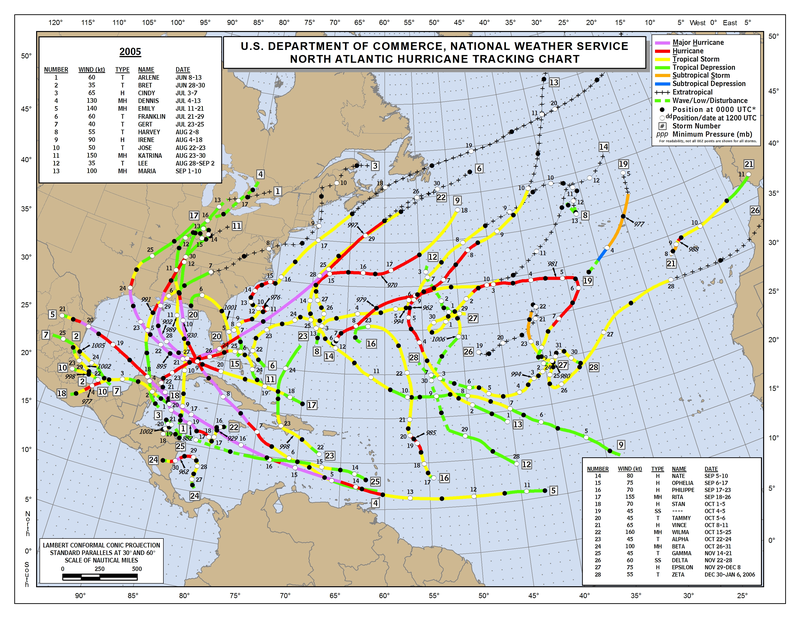 Compare that to the map below of the 2005 Hurricane season, the most active hurricane season ever, since records began in 1891.